So I picked up this set in the January sales and I’ve been meaning to get round to using it. When I recently went in to pick up a new foundation from bareMinerals, the manager in store told me I need to check out the skin care as I was whinging about my awful skin. 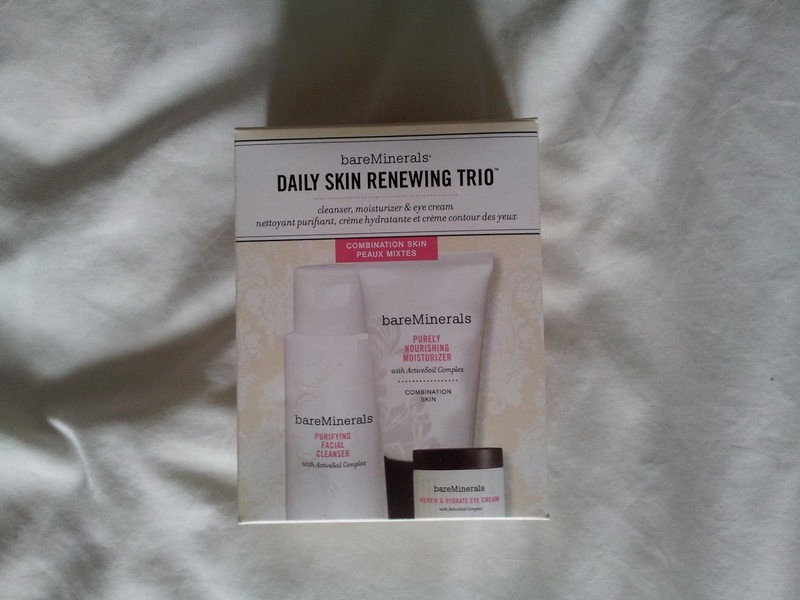 I’d breakouts going on, scarring from previous spots, uneven skin and generally speaking, my skin felt utterly rubbish. I have combination/oily skin. bareMinerals to the rescue! In this kit I got travel sized products, a Purifying Facial Cleanser, Purely Nourishing Moisturiser and a Renew & Hydrate Eye cream. I am officially in love. 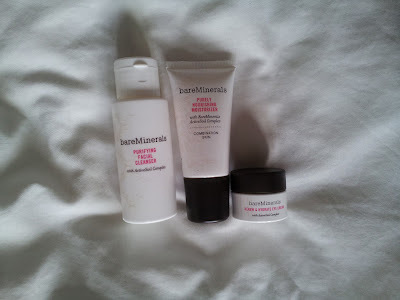 I went home and after a few more days of using my previous skin routine, I gave in and switched to the bareMinerals skin care. My only regret is that I didn’t do it sooner! I’ve been using this over 2 weeks and my skin has done nothing but improve! The Cleanser does not remove makeup in anyway shape or form, so I recommend using a makeup remover to remove eye and face makeup. Then use this cleanser. It smells like a combination of essential oils. It was a thin consistency and you only need a small amount. Dampen your face and put some of this on your hands then work it into a lather, then rinse and dry. This leaves my skin lovely and soft and generally just feeling lovely and clean. The Moisturiser is also fabulous. At night I use this after the Active Cell Renewal Night Serum (which I’ll discuss shortly) before moisturising, or in the mornings I use a toner first and then moisturise. This moisturiser isn’t a heavy moisturiser, it is again quite thin but not as thin as a lotion. 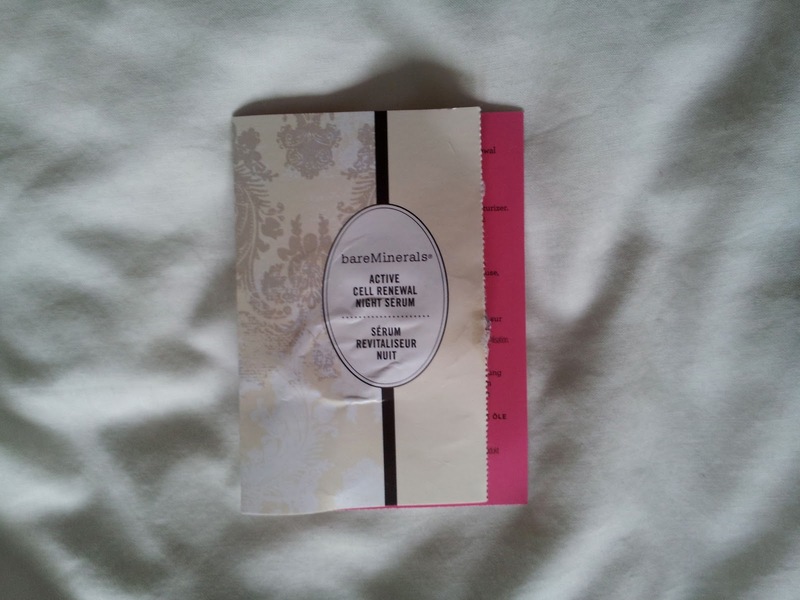 It applies really well and spreads across my face nicely, it also absorbs into the skin really well. I love how this leaves my skin feeling, lovely and moisturised as well as plumper and generally my skin looks healthier. The Eye cream, I’m not so fussed on. It recommends using it morning and night, which I did, but it started to feel too heavy and that it was clogging the skin around my eyes. I didn’t see any massive improvement to the skin around my eye area. I’ve switched to using it once a day – at night time. I won’t repurchase this eye cream. Now onto my favourite skin care item, the Active Cell Renewal Night Serum. This is a definite Holy Grail item for me. I do not say this lightly! I noticed a difference in my skin after first use. Seriously. I woke up the nice morning and my skin still feel really moisturised and plump and lovely, without being greasy at all. You put a few drops onto your finger tips, rub your finger tips together to warm the serum, then I pat it onto various points on my face and then I’ll rub it in all over. This applies really well and absorbs really well. I love using the moisturiser after this, as not only do you need less moisturiser, but the combination of the scents is just fabulous. So my skin looks good, feels good and smells good! I had two samples of the night serum and I notice the difference in my skin since running out. My skin although still clearing up nicely, the scarring isn’t healing as quickly and my skin doesn’t feel as soon. I miss the serum and I will be buying the full size on payday. I will also be purchasing a full size of the cleanser and moisturiser. I’m really impressed with these products.